Goldman Sachs, Ernst & Young, HSBC and Barclays were among corporate event planners at the annual Oysters summer party. Almost 370 people attended the annual Oysters summer party, held this year at Kensington Roof Gardens. BT, Deutsche Bank and Credit Suisse were also among guests at the party, which featured 24 destinations, as well as entertainment from Stavros Flatley. Henna painting, global food, calligraphy, and beat boxing also entertained guests. Tourism Flanders-Brussels MICE manager Sarah Mathews said: "I was really pleased with the turnout and people loved the experiences." 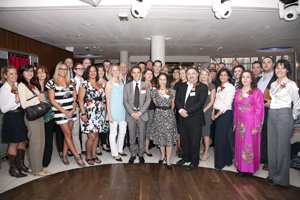 Agencies including Black Tomato, Blue Hat UK, DBMT and Grass Roots joined corporate event planners for the evening. See pictures from the Oysters summer party here.